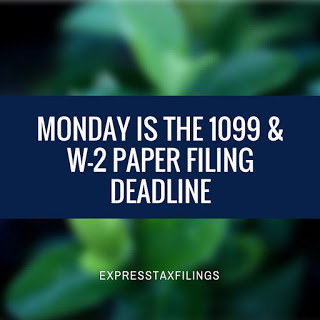 Heads up, paper filers: your time to file 1099s and W-2s has almost run out! That’s right, if you intend to mail in your 1099 and/or W-2 forms, you’ll need to make sure they’re postmarked and in the mail no later than Monday, February 29, 2016. But before you start scrambling around for the information you need and resign yourself to a weekend of unforeseen stress, consider the e-filing option. Firstly, you have to e-file anyway if you have more than 250 forms, so if you’re a high volume filer, it’s time to make the switch (or time to get used to paying penalties). One of the biggest selling points of e-filing, though, is that you automatically get an extra month to complete your returns when you choose to e-file. And it’s not like you have to alert the IRS or SSA that you’re e-filing instead of paper filing: just make sure you meet the e-filing deadline, which is March 31, 2016. Additionally, there are fewer additions when you e-file. What we mean by that is, when you e-file, you don’t have to include the supplementary transmittal returns 1096 and W-3 that are paper filed with 1099 and W-2 forms. But don’t worry: if you e-file with ExpressIRSForms, we’ll generate a copy of these forms for your records based on your return, so you don’t have to go a whole year without seeing them. In addition to your federal filing, make sure you’re compliant with your state filing requirements. State requirements vary and usually include a transmittal form or reconciliation report to complete the filing. You can find out more about your state’s requirements at our State Filing page, or check with your state’s Department of Revenue. Paper filing’s not our forte, but you can try any questions you have out on us (psst…or just ask us about e-filing! ), by calling, chatting, or emailing us. We’re available on the phones and live chat Monday through Friday, 9 a.m. to 6 p.m. EST, and by email 24/7 at support@expressirsforms.com. Toys ‘R’ Us Files Chapter 11: How Your Small Business Can Avoid This?